Meanwhile flows in all directions; it is built on Scott McCloud’s principle of the infinite canvas. Whenever the path splits, you’ll see two yellow outlines. (Or three, or more!) Choose your path and tap your decision! The story will follow the path you choose. 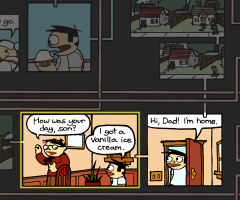 Of course, you can scroll around the entire story map if you want, and even zoom in and out. The browse button lets you view the story as a whole, without highlights or outlines. While browsing, you can tap any panel to jump into the story and follow the thread from that point. Meanwhile has many secrets, and you will not discover them all the first time you enter. Don’t be afraid to start over, backtrack, or try different approaches. The more you learn, the more you will understand. Jason Shiga graduated from the University of California at Berkeley with a degree in pure mathematics. He is the author of more than twenty comic books and the inventor of three board games, two card tricks, the greedy mug, the bus clock, and Meanwhile. His puzzles and mazes have appeared in McSweeney’s and Nick Magazine. He lives in Oakland, California. Andrew Plotkin is the author of many well-known works of interactive fiction. He lives in Boston, Massachusetts, where he is hard at work researching both classic forms of digital interactivity (like text adventures) and new forms (like Meanwhile). Together they have brought Meanwhile to life, for the first time, in digital form. Meanwhile began as a series of seven increasingly complex flowcharts. 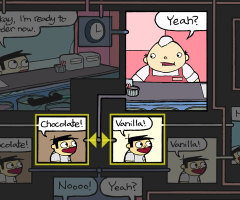 Once the outline of the story was structured, a computer algorithm determined the most efficient way to transfer it to book form, using a system of tabs to interlink the panels and pages. The problem proved to be NP-complete; it was finally cracked in spring of 2000, with the aid of a V-opt heuristic algorithm which ran for twelve hours on an SGI machine. The first page-and-tab edition of Meanwhile was (self-) published by Jason Shiga in 2001, as a hand-cut black-and-white booklet. In 2010, it was re-released by Amulet Books in a handsome full-color hardback edition. Andrew Plotkin encountered Meanwhile in 2010, and was immediately entranced by the idea of creating a fully interactive game version. He approached Jason with a prototype in February of 2011. 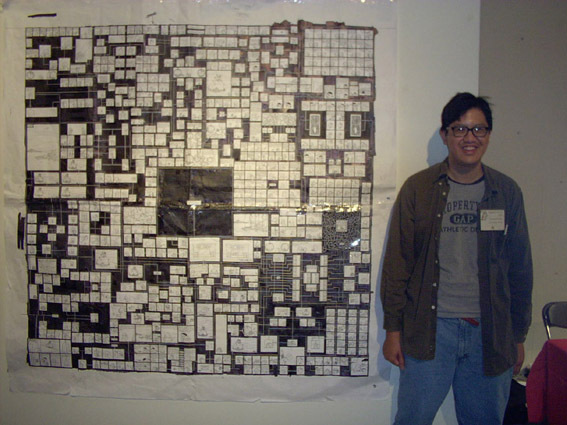 Jason responded with a five-foot-square story map of Meanwhile that he had sketched out in 2004. The rest remains to be history. Buy the hardback edition of Meanwhile from Amulet Books. Web site text and design copyright 2012-2018 by Zarfhome Software Consulting, LLC. 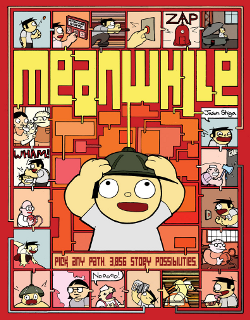 Meanwhile text and illustrations copyright 2001-2012 by Jason Shiga. Meanwhile is published by Amulet Books, an imprint of Abrams Books.